I have not been posting new recipes on a regular basis like before as I am updating my old ones. Whenever I write a post, I do read it again to check for grammatical or spelling mistakes. However, sometimes the eagle eye misses them. I am also updating the photos as my old ones were not good or too hazy. I still am not a professional photographer, but with my iphone, I try my best. 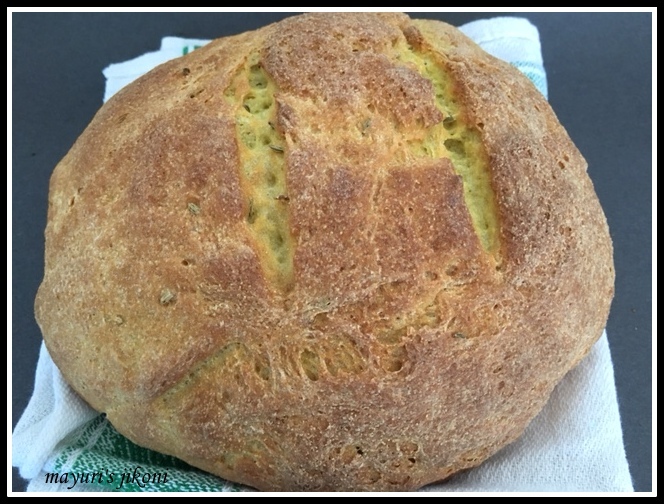 Today’s post is a Portuguese corn bread which was our February challenge for the We Knead to Bake (started by Aparna of My Diverse Kitchen) members. Milho means cornmeal. This cornmeal is quite different from the one made in US. Its not sweet,it uses yeast, its a bit dense, with a nice crust and soft interior. This bread is usually served with a soup or stew but can also be served with eggs. I had it dunked in milk and it was really so yummy. It was traditional made by the peasants from white or yellow cornmeal and wheat flour. This bread is also very popular in the Spanish region of Galicia and Brazil. This bread is easy to make and delicious.Remember to use corn meal ( makkai ka atta, ugali flour) and not cornstarch or cornflour.I added fennel seeds to make it more Brazilian and it tasted good. I used only 2 cups of flour and used about ¼ cup to dust on the worktop while kneading the dough. ½ cup of milk was enough. Put cornmeal in a big bowl. Add hot water, milk, honey and salt. Mix it well. It should look like a paste. Leave the mixture to become lukewarm. Add flour, yeast, oil and fennel seed to the lukewarm mixture. Form a dough. Dust the worktop or board with some flour and knead the dough till it becomes smooth and is slightly sticky. Grease a bowl with oil. Shape the dough into a ball and put it in the bowl. Cover it with a cling film and leave it in a warm place to rise for 1½ – 2 hours. Mine took 1¼ hours. Lightly dust the worktop or board again. Take out the risen dough. Knead it gently and shape it into a ball. Grease a baking tray with oil or line it with parchment paper. Place the shaped dough on it. Cover with a tea towel and let it rise again for 1 hour. Mine took 45 minutes. Make 2 slashes on the top of the dough if you like. Bake at 200°C for 10 minutes. Lower the temperature to 180°C and bake further for 15-20 minutes until the top is golden brown. If knocked at the bottom end, the loaf should should hollow if it is done. Remove the loaf from the oven and let it cool on a wire rack. Serve with soup, stew, tea, curry or milk. I loved it dunked in milk. Use fine flour and not the coarse one. If you don’t get fine flour, just pulse in the coffee grinder to get the fine semolina texture. The amount of milk required will depend on how much the cornmeal absorbs the liquid. If you don’t get yellow cornmeal, use polenta or white corn meal. If using white cornmeal. Looks perfect loaf, love it. Looks lovely.. actually the fennel seeds are added in the sweeter version which is made without yeast (with baking powder) in the cookie shape..small in size. It is served in the Padarias (cofee shops) along with Brazilian coffee. You can't beat homemade bread. It always smells so amazing!